Photo: Enjoying the moment in Chicago were (L-R) Brad Salem, Harlon Barentt, Trae Waynes and Mark Dantonio. Michigan State head coach Mark Dantonio traveled in December to the stately Waldorf Astoria in New York when punter Mike Sadler was honored as an academic All-American pick by the National Football Federation. With or without another such honoree this December, he’ll likely return to the NFF dinner when Clinton Jones is enshrined in the College Football Hall of Fame. The two-time All-American halfback’s induction fits nicely with the 50th anniversary of Michigan State’s first of back-to-back undefeated Big Ten titles and national crowns. Last weekend Dantonio was in Chicago as the NFL Draft moved out of New York for the first time in its long history. He attended with cornerback Trae Waynes projected as a first-round pick. College head coaches attending the NFL Draft isn't as common as you might assume, and Dantonio also brought assistant coaches Brad Salem, who recruited Waynes, and Harlon Barnett, who coached him. 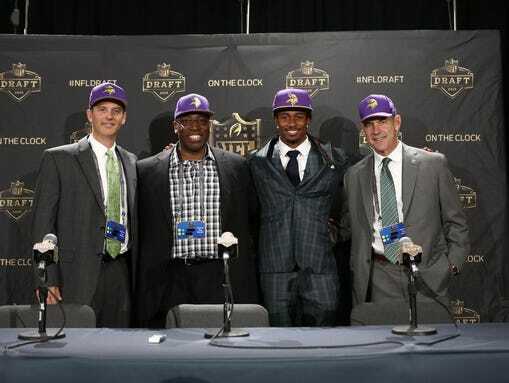 They all shared the moment Thursday night when Waynes was the first cornerback selected as the 11th overall pick. Waynes followed last year’s Spartans first-round corner, Darqueze Dennard, to make Michigan State one of only six schools in draft history with first-round corners in back-to-back years. And note that this is an era when cornerbacks have been never more valuable to recruit and develop. Yes, Dantonio has been going places – and bringing along with him the program he has revived to the standards of Duffy Daugherty and Biggie Munn in the 1950s and 1960s. The numbers say Dantonio has moved Michigan State past the stage when some of the success in 2010 (a three-way tie for the Big Ten title) and 2011 (Big Ten Legends title before a loss to Wisconsin in the conference championshp game) were dismissed by some as the Spartans capitalizing on a downturn at Michigan under two otherwise proven coaches, Rich Rodriguez and Brady Hoke, and ramifications from an NCAA probation and a coaching change at Ohio State that opened the door to Urban Meyer to return to the sidelines in 2012. But Michigan State's 2013 Big Ten title and Rose Bowl victory along with last season’s Cotton Bowl triumph have made skeptics believers that Michigan State can contend for a College Football Playoff berth and national title in 2015. And so do the names called in the NFL Draft. There were four 2015 picks and five other Spartans signed as free agents. In addition to Waynes, running back Jeremy Langford was a Chicago fourth-rounder; wide receiver Tony Lippett a fifth-round cornerback by Miami; and wide receiver Keith Mumphrey a Houston fifth-rounder. The free agents were safety Kurtis Drummond, Houston; tight end Andrew Gleichert, Philadelphia; linebacker Taiwan Jones, New York Jets; defensive end Marcus Rush, San Francisco; and Sadler Tampa Bay. Nine players is almost a starting unit. Dantonio’s revival hasn’t gone unnoticed on the recruiting trail. Michigan State every once in a while would beat out college football heavyweights for a kid from the state of Michigan, but now they’re beating Alabama, Ohio State and others for out-of-state kids. Among the recruiting Class of 2016 prizes are Rivals 4-star quarterback Messiah deWeaver, Huber Heights (Ohio) Wayne; 4-star wide receiver Justin Layne, Cleveland Benedictine; and 4-star wide receiver Cameron Chambers, Sicklerville (NJ) Timber Creek. “We're selling results. We're not selling hope,” said Dantonio, who had nothing but hope to sell when he took over a 4-8 team eight years ago. “We've won bowl games. We've won a (Big Ten) championship. We've won a Rose Bowl. We finished in the top five this year, did some good things. Our players are being drafted. We're graduating our players. There's a lot of positive momentum moving in this program. And I think you always are going to need to get better or you get worse.